I recently bought The Forward Book of Poetry 2014. I buy this anthology every year as it is a collection of poems which were considered for the Forward Prizes each year. The best collection, I was very happy to see, went to Michael Symmons Roberts for his book Drysalter which I have featured on this blog e.g. here. The foreword to the book, written by Jeanette Winsterston, has a dramatic start. Winterson writes “POETRY IS THE BOMB [original capitalisation] and the safe exploding of the bomb”. The author acknowledges that this may be “too violent an image” but argues that the world is besieged by the rich, environmental and religious problems, and by information overload. Winterson concludes that “The poem as the bomb is the poem as the flash of energy capable of blasting an opening into our private bunker”. You can read the foreword by clicking on the book cover here. Today, I read one of the poems At Llantwitt Beach by Oliver Dixon, which includes the imaginative lines “the sea itself now/ that giant loom/ perpetually unravelling/ the striped tapestry/ it’s just woven”. The book is a snip at £8.99, so buy it now. There are many, many recipes for chowder including fish – just do a search. I’ve been making smoked haddock chowder for a long time, and I started off only including smoked haddock along with leek, carrots, potatoes (mashed and chopped), fish stock, milk and crème fraiche or cream. Recently, I have started adding salmon to the chowder and including some celery. So, my method is to sweat a large, thinly chopped leek, 2 carrots diced small and 2 sticks of celery. I then put the smoked haddock and salmon, cut into big chunks, on top of the vegetables. I turn the fish and cook until it’s steamed and then I add half pint of fish stock, made up to a pint with milk. To this I add previously cooked mash potato and chopped potato. To finish, I add the crème fraiche or cream and simmer for about 10 minutes. Serve the chowder with a crispy baguette warmed in the oven, and 2 servings of this constitute a full meal. You can of course, add prawns, mussels or other fish, as chowder is one of the most flexible of soups. It tastes delicious. 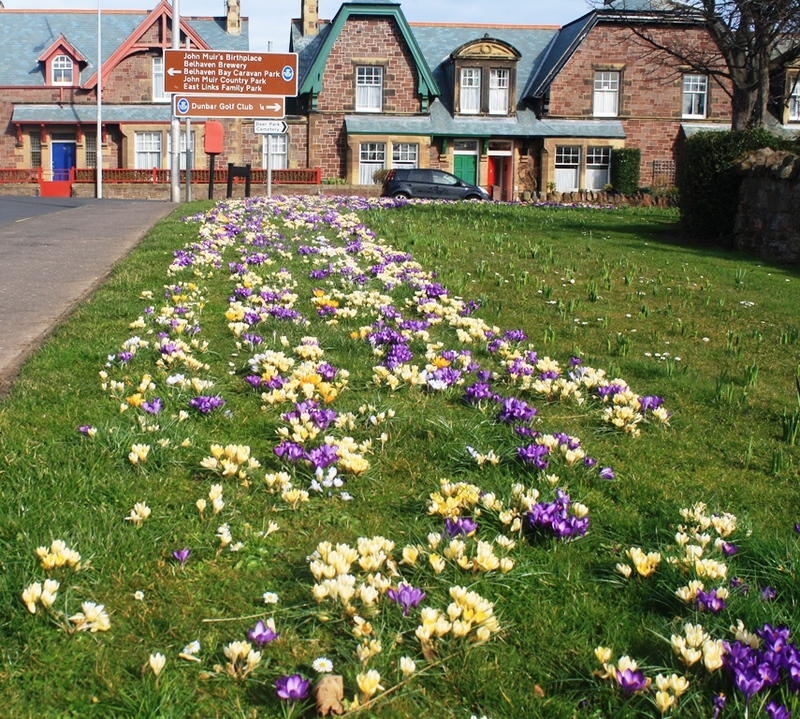 March sees the crocuses emerge from grassy areas here in Dunbar and there’s a magnificent display in the nearby village of West Barns, which is known to some of its former residents as The People’s Republic of West Barns. The photos below are from Spott Road in Dunbar, just up the road from my house. The crocus is one of the oldest known flowers and following on from the snowdrops, the crocuses provide a welcome splash of bright colours at (you hope) the end of winter. 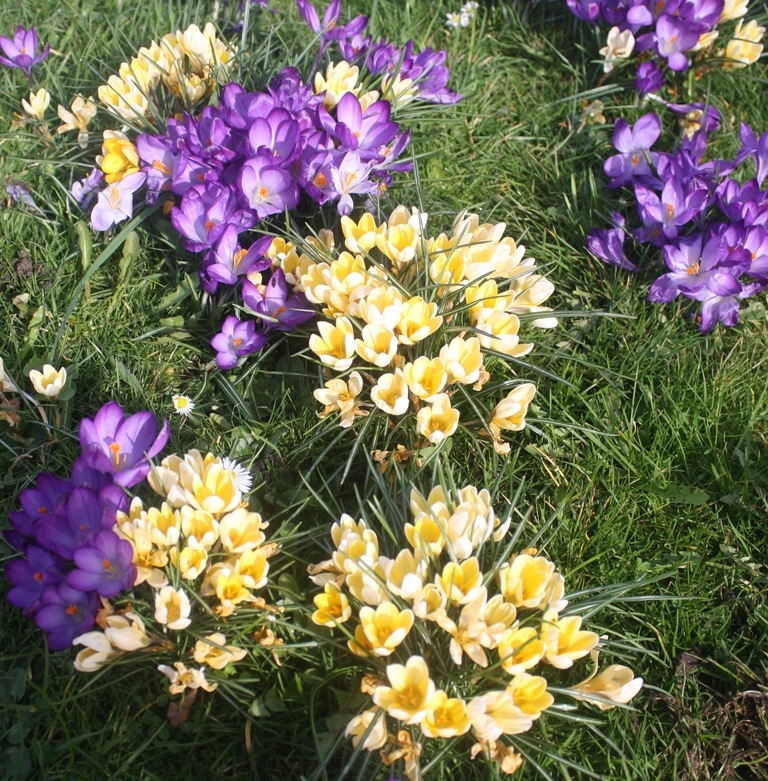 Thomas Hardy’s poem The Year’s Awakening asks how the crocus bulb knows that winter might be over and that there will be “mild airs that do not numb”. 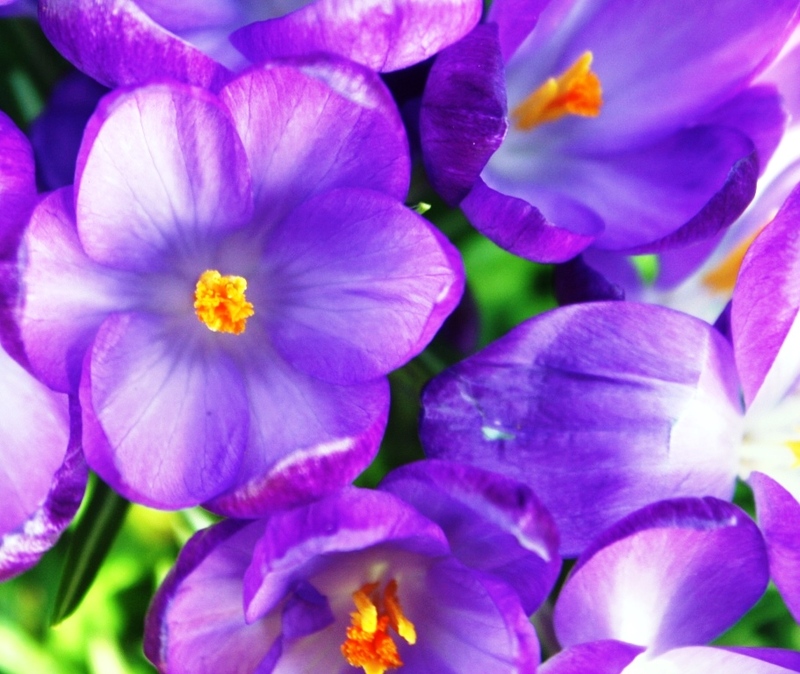 Once the crocuses are above ground, however, you have to admire their beauty because, as soon as strong winds arrive, their delicate petals are threatened. This entry was posted on March 15, 2014 at 12:57 am and is filed under Cooking, Dunbar, Flowers, Food, Photography, Poetry, Reading, Sea. You can follow any responses to this entry through the RSS 2.0 feed. You can leave a response, or trackback from your own site.